Background: A successful endodontic treatment depends on efficient cleaning and shaping and effective irrigation of root canals. The irrigating solution may not be effective in some areas in the canal. The manufacturer of XP-Endo finisher claims that it can effectively clean the root canals with complex morphology. This study aimed to assess the effect of XP-Endo finisher on the amount of residual debris and smear layer on the root canal walls of mandibular second premolars. Materials and Methods: In this In vitro study Fifty extracted mandibular second premolars with a root curvature <20° were collected. Root canals were prepared using BioRaCe rotary system. The root canals were in contact with the file and different irrigating solutions for 1 min. The teeth were then randomly divided into four experimental (n = 10) and one positive control group as follows: (1) XPF + saline, (2) XPF + ethylenediaminetetraacetic acid (EDTA), (3) XPF + sodium hypochlorite (NaOCl), (4) XPF + EDTA + NaOCl and (control) EDTA + NaOCl. The teeth were longitudinally sectioned into two halves and the amount of debris and smear layer remaining in the coronal, middle, and apical thirds of the roots was quantified and scored under an electron microscope. The Kruskal–Wallis test was used to compare the groups, and P < 0.05 was considered statistically significant. Results: The highest mean amount of residual debris (2.9 ± 1.13) was noted in XPF + saline group (P < 0.05). XPF + saline and XPF + NaOCl (3.8 ± 0.60) had the lowest efficacy for smear layer removal (P < 0.05) with no significant within-group difference. No significant difference was noted between Groups 2, 3, and 4 with the positive control group regarding debris removal. Groups 2 and 4 had no significant difference with the positive control group regarding smear layer removal. Conclusion: Use of XP-Endo finisher has no superiority to the standard protocol for the use of irrigating solutions (EDTA + NaOCl) for debris and smear layer removal, but in some cases, such as second appointment of regeneration treatment we cannot use NaOCl because of its destructive effects on stem cells; thus, we can benefit from the synergistic effects of XPF and EDTA for better smear layer removal. The common protocol for smear layer removal includes the use of sodium hypochlorite (NaOCl) followed by ethylenediaminetetraacetic acid (EDTA), each for 1 min. However, penetration of solutions into the isthmus area and other hard-to-reach areas in the canal is influenced by the preparation size, degree of taper, and surface tension of the solution. Furthermore, the irrigating solution may not be effective in some areas in the canal.,, The FKG Dentaire SA company in Switzerland recently introduced the XP-Endo finisher, a new NiTi file, into the market. The manufacturer claims that this file can effectively clean the root canals with complex morphology or very narrow straight or highly curved canals. These properties are attributed to the small size of the central core (ISO 25 diameter), 0% taper, MaxWire NiTi alloy, molecular phase transformation of the file in body temperature, high flexibility of the file, and its ability to access the surrounding environment by 6 mm or 100 times it's primary volume. At room temperature, the file is straight and in martensite phase (20°). When entered into the canal at body temperature (35°), it transforms to austenite phase considering its molecular memory. On cooling, it transforms back to the martensite phase and its straight form. The manufacturer claims that the XP-Endo finisher file can remove dentin from the root canal surface and guide chemical solutions to the hard-to-reach areas. By doing so, it enhances the dissolution of biofilm and microorganisms. This study aimed to assess whether the use of this file accompanied by the standard irrigation protocol can yield a cleaner canal surface. In this In vitro study Fifty extracted human mandibular second premolars were collected and immersed in 0.1% thymol solution (Ogna, Muggio, Italy) for 1 h. After cleaning of the root surfaces from debris and tissue residues using a sterile gauze, the teeth were stored in saline until the experiment. The roots were inspected for cracks, fractures, root caries or external root resorption, and the teeth with such defects were excluded from the study. The teeth were then standardized regarding length by measuring the tooth length from the buccal cusp tip to the root end and the teeth with 18–22 mm length were included in the study. The canal curvature was measured by introducing a #15 K-file (Maillefer, Dentsply, Ballaigues, Switzerland) into the canal to the working length and taking a buccolingual radiograph using the parallel technique with the help of Endo-Ray film holder and photostimulable phosphor plate sensor (Soredex, Helsinki, Finland). The canal curvature was determined using the Schneider's method and the teeth with canal curvature <20° were included in the study. Access cavity was prepared using high-speed hand-piece (W and H Dentalwerk GmbH, Burmoos, Austria) operating at 20,000 rpm and 008 cylindrical bur (Tizkavan, Tehran, Iran). Straight access was created. A #10 K-file was introduced into the canal to ensure canal patency. Apical canal diameter was checked using a #15-K file (file could not pass the apical foramen). Roots not meeting these conditions and teeth with a lateral apical foramen were excluded. A #15 K-file was introduced into the canal until its tip was visible at the apex. Working length was determined 1 mm short of this length. The teeth were then coded and randomly divided into four experimental (n = 10) and one positive control group. 17% EDTA (1 min) +5 mL of saline + 2.5% NaOCl (1 min). Finally, all canals were rinsed with 5 mL of saline. Next, canals in all five groups were dried with paper points (Dentsply-Maillefer, Konstanz, Germany). Almost the entire canal wall is covered with debris. Heavy, irregular smear layer covering the entire canal walls. The Kruskal–Wallis test was used for the comparison of groups, and P < 0.05 was considered statistically significant. Variable amounts of debris and smear layer were noted on canal walls. Removal of the smear layer and debris was equal in the coronal, middle, and apical thirds with no significant difference (P > 0.05). [Table 1] shows the order of groups regarding the amount of residual debris. The results showed that the saline group had the highest mean amount of residual debris. The highest amount of residual debris was noted in saline group (2.9 ± 1.13; P < 0.05). XPF + saline and XPF + NaOCl had the lowest efficacy for smear layer removal (3.8 ± 0.60; P < 0.05) with no significant within-group difference. [Table 2] shows the order of groups regarding the amount of residual smear layer. 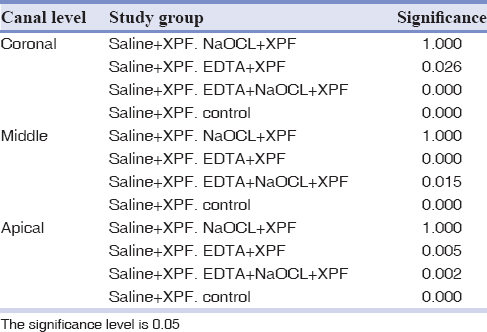 The XPF + saline and XPF + NaOCl groups showed the lowest removal of the smear layer compared to all other groups (P < 0.05) with no significant within-group difference. Regarding debris removal, no significant difference was noted between Groups 2, 3, and 4 with the positive control group. Regarding smear layer removal, no significant difference was noted between the Groups 2 and 4 with the positive control group. [Figure 1] shows representative scanning electron microscope photomicrographs (×3000) of debris and smear layer in different groups at the coronal, middle, and apical thirds. Figure 1: Representative scanning electron microscope photomicrographs (×3000) of debris and smear layer in different groups at the coronal (C), middle (M) and apical (A) thirds. The main goal of endodontic treatment is cleaning and preparation of root canal walls to ensure removal of necrotic and vital pulp tissue, bacteria, debris, and smear layer and prevent re-contamination of the canal. Use of NiTi files is increasing in endodontic treatments. These files are elastic and adapt to the canal wall due to their low modulus of elasticity. Compared to stainless steel files, NiTi files have lower frequency of procedural errors such as ledge formation, zipping, and canal transformation and are less susceptible to fracture. The BioRaCe rotary file used in the current study prepares the apical region to larger sizes (#40) and thus, provides a larger space for the activity of solutions in the apical region.,, Previous studies confirmed that NiTi rotary files contact the canal walls by 40%–45% during root canal preparation and thus, a great part of the canal walls remains unprepared., One unique property of XPF file is molecular phase transformation at body temperature. In Austenite phase, this file better adapts to the canal wall and results in more efficient cleaning. In this study, ×3000 magnification was used because although high amounts of smear layer can be seen in lower magnifications, the debris, and dentinal tubules are only seen at higher magnifications. To quantify the amount of residual debris and smear layer, the Hulsmann scoring system was used, which is reliable and reproducible. 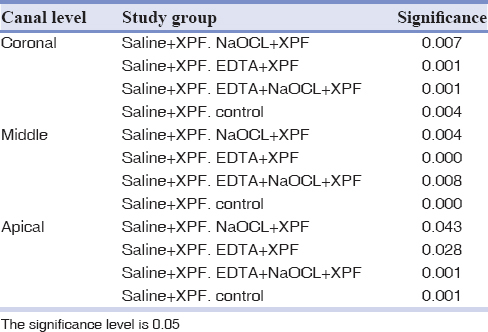 The amount of residual smear layer in different parts of the canal in this study revealed that XP + saline and XP + NaOCl groups had the highest amount of residual smear layer. XPF plus EDTA alone or EDTA and NaOCl better removed the smear layer, which may be due to the chelating action of EDTA for smear layer removal. This was in agreement with the results of the previous studies.,,,, In contrast to some studies, this study showed that XPF combined with NaOCl solution alone had lower efficacy for smear layer removal.,, This difference may be due to the volume, concentration or frequency of use of irrigating solutions. Considering different protocols for the use of irrigating solutions, 2 mL of 2.5% NaOCl was used for canal irrigation along with XPF in the current study while Wigler et al. used 5 mL of 4% NaOCl for canal preparation and 5 mL of 4% NaOCl and 5 mL of 17% EDTA after canal preparation for smear layer removal. Also, 5 mL of 4% NaOCl was used with XPF. Bao et al. used 5.25% NaOCl and 17% EDTA for smear layer removal at first and then used XPF along with 1 mL of 3% NaOCl. They performed three-step irrigation. In this method, NaOCl irrigating solution is changed three times. Moreover, final canal rinse and flushing can also help in effective removal of the smear layer. For this purpose, 5 mL of saline was used in this study while Slavoljub et al. used 5 mL of 2% NaOCl and Elnaghy et al. used 1 mL of 2.5% NaOCl solution for 1 min plus 5 mL of saline. Wigler et al. used 5 mL of 4% NaOCl and Bao et al. used 1 mL of saline for 30 s as well as 4 mL of 17% EDTA for 2 min. Canal preparation size by the rotary system is also important in this respect because widening of the apical third of the canal results in better contact of XPF file as well as NaOCl and EDTA solutions with the canal wall. As the result, greater amounts of debris and smear layer are removed. In the current study, BioRaCe system with 4% taper was used while Leoni et al. used WaveOne rotary system with 6% and 8% taper, Bao et al. used Vortex Blue rotary system with 4% and 6% taper, and Elnaghy et al. used BT Race rotary system with 4% and 6% taper. According to the current results, use of XP-Endo finisher has no superiority to the standard protocol of irrigating solutions (EDTA + NaOCl) for debris and smear layer removal. Deplazes P, Peters O, Barbakow F. Comparing apical preparations of root canals shaped by nickel-titanium rotary instruments and nickel-titanium hand instruments. J Endod 2001;27:196-202. Sen BH, Wesselink PR, Türkün M. The smear layer: A phenomenon in root canal therapy. Int Endod J 1995;28:141-8. Yang G, Wu H, Zheng Y, Zhang H, Li H, Zhou X, et al. Scanning electron microscopic evaluation of debris and smear layer remaining following use of ProTaper and hero shaper instruments in combination with NaOCl and EDTA irrigation. Oral Surg Oral Med Oral Pathol Oral Radiol Endod 2008;106:e63-71. Uitto VJ, Haapasalo M, Laakso T, Salo T. Degradation of basement membrane collagen by proteases from some anaerobic oral micro-organisms. Oral Microbiol Immunol 1988;3:97-102. Wu MK, Wesselink PR. Efficacy of three techniques in cleaning the apical portion of curved root canals. Oral Surg Oral Med Oral Pathol Oral Radiol Endod 1995;79:492-6. Clark-Holke D, Drake D, Walton R, Rivera E, Guthmiller JM. Bacterial penetration through canals of endodontically treated teeth in the presence or absence of the smear layer. J Dent 2003;31:275-81. Kokkas AB, Boutsioukis AC, Vassiliadis LP, Stavrianos CK. The influence of the smear layer on dentinal tubule penetration depth by three different root canal sealers: An in vitro study. J Endod 2004;30:100-2. Cobankara FK, Adanr N, Belli S. Evaluation of the influence of smear layer on the apical and coronal sealing ability of two sealers. J Endod 2004;30:406-9. Chan AW, Cheung GS. A comparison of stainless steel and nickel-titanium K-files in curved root canals. Int Endod J 1996;29:370-5. Carson KR, Goodell GG, McClanahan SB. Comparison of the antimicrobial activity of six irrigants on primary endodontic pathogens. J Endod 2005;31:471-3. Torabinejad M, Khademi AA, Babagoli J, Cho Y, Johnson WB, Bozhilov K, et al. Anew solution for the removal of the smear layer. J Endod 2003;29:170-5. FKG Dentaire SA. XP-endo Finisher [brochure]. La Chaux-de-Fonds: FKG Dentaire SA. Available from: http://www.fkg.ch/sites/default/files/fkg_xp_endo_brochure_en_vb.pdf. West JD, Raone JB, Goerig AC. Cleaning and shaping the root canal system. In: Cohen S, Burns RC, editors. Pathway of the Pulp. 6th ed. St. Louis, USA: Mosby Year Book; 1994. p. 179-218. Torabinejad M, Walton RE. Endodontics: Principles and Practice. 4th ed. St. Louis: Saunders/Elsevier; 2009. Schäfer E, Lohmann D. Efficiency of rotary nickel-titanium flexMaster instruments compared with stainless steel hand K-flexofile – Part 1. Shaping ability in simulated curved canals. Int Endod J 2002;35:505-13. Sharma G, Kakkar P, Vats A. A comparative SEM investigation of smear layer remaining on dentinal walls by three rotary NiTi files with different cross sectional designs in moderately curved canals. J Clin Diagn Res 2015;9:ZC43-7. Schäfer E, Vlassis M. Comparative investigation of two rotary nickeltitanium instruments: ProTaper versus RaCe. Part 2. Cleaning effectiveness and shaping ability in severely curved root canals of extracted teeth. Int Endod J 2004;37:239-48. Usman N, Baumgartner JC, Marshall JG. Influence of instrument size on root canal debridement. J Endod 2004;30:110-2. Poggio C, Dagna A, Chiesa M, Scribante A, Beltrami R, Colombo M, et al. Effects of NiTi rotary and reciprocating instruments on debris and smear layer scores: An SEM evaluation. J Appl Biomater Funct Mater 2014;12:256-62. Prati C, Foschi F, Nucci C, Montebugnoli L, Marchionni S. Appearance of the root canal walls after preparation with NiTi rotary instruments: A comparative SEM investigation. Clin Oral Investig 2004;8:102-10. Zand V, Lotfi M, Rahimi S, Mokhtari H, Kazemi A, Sakhamanesh V, et al. Acomparative scanning electron microscopic investigation of the smear layer after the use of sodium hypochlorite gel and solution forms as root canal irrigants. J Endod 2010;36:1234-7. Slavoljub Ž, Jelena N, Milica J, Marijana P, Marija Ž. XP-endo finisher: A new solution for smear layer removal. Serbian Dent J 2015;62:122-6. Elnaghy AM, Mandorah A, Elsaka SE. Effectiveness of XP-endo finisher, EndoActivator, and file agitation on debris and smear layer removal in curved root canals: A comparative study. Odontology 2017;105:178-83. Azim AA, Aksel H, Zhuang T, Mashtare T, Babu JP, Huang GT, et al. Efficacy of 4 irrigation protocols in killing bacteria colonized in dentinal tubules examined by a novel confocal laser scanning microscope analysis. J Endod 2016;42:928-34. Uygun AD, Gündoǧdu EC, Arslan H, Ersoy İ. Efficacy of XP-endo finisher and TRUShape 3D conforming file compared to conventional and ultrasonic irrigation in removing calcium hydroxide. Aust Endod J 2017;43:89-93. Wigler R, Dvir R, Weisman A, Matalon S, Kfir A. Efficacy of XP-endo finisher files in the removal of calcium hydroxide paste from artificial standardized grooves in the apical third of oval root canals. Int Endod J 2017;50:700-5. Silva EJ, Belladonna FG, Zuolo AS, Rodrigues E, Ehrhardt IC, Souza EM, et al. Effectiveness of XP-endo finisher and XP-endo finisher R in removing root filling remnants: A micro-CT study. Int Endod J 2018;51:86-91. Leoni GB, Versiani MA, Silva-Sousa YT, Bruniera JF, Pécora JD, Sousa-Neto MD, et al. Ex vivo evaluation of four final irrigation protocols on the removal of hard-tissue debris from the mesial root canal system of mandibular first molars. Int Endod J 2017;50:398-406. Keskin C, Sariyilmaz E, Sariyilmaz Ö. Efficacy of XP-endo finisher file in removing calcium hydroxide from simulated internal resorption cavity. J Endod 2017;43:126-30. Garip Y, Sazak H, Gunday M, Hatipoglu S. Evaluation of smear layer removal after use of a canal brush: An SEM study. Oral Surg Oral Med Oral Pathol Oral Radiol Endod 2010;110:e62-6. 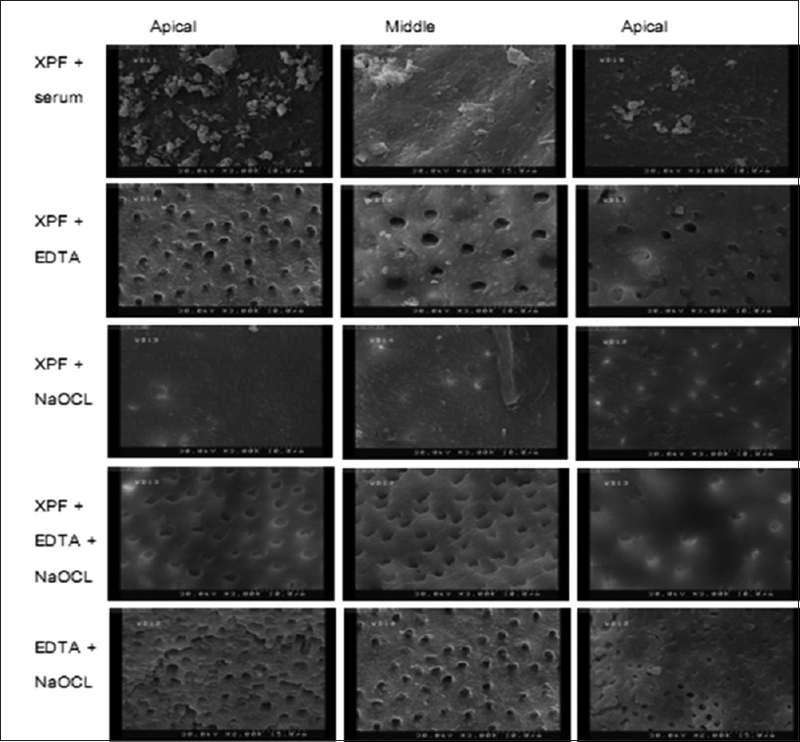 Bao P, Shen Y, Lin J, Haapasalo M.In vitro efficacy of XP-endo finisher with 2 different protocols on biofilm removal from apical root canals. J Endod 2017;43:321-5.